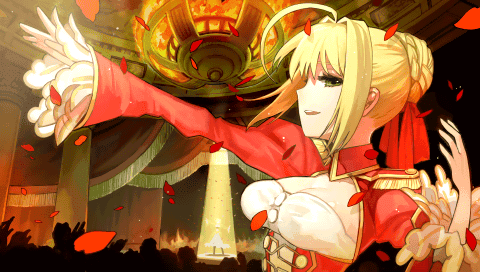 Saber is the strongest playable Servant when it comes to raw strength and also the easiest to raise. ­She's designed for novice players, so a slight boost to her strength will allow her to destroy most enemies with just a few swings. Here's a guide to playing Saber. Raises damage done to enemies. It is recommended to invest as much SP as possible into this parameter, early in the game. This makes grinding a lot easier since you can kill normal enemies in just 2 to 3 hits. Lowers damage done to enemies. Defense doesn't only makes you tough but increases Skill damage as well. So invest into this parameter when you have enough Strength. Stabilizes damage stats, raises skill speed. Invest into this parameter when you are done with Strength and Defense. Raises magic ability, lowers damage from magic. Invest into this parameter only if you have some extra SP to spare. Raises critical hit rate and defense when in jeopardy. Inflicts physical damage on an enemy. Unlocked after spending 10 SP on Alteration. The damage inflicted by ATTACK increases. Unlocked after spending 20 SP on Alteration. Increases item drop rate after battle. Unlocked after spending 30 SP on Alteration. Absorbs enemy HP when using BREAK. Unlocked after spending 35 SP on Alteration. Unlocked after spending 50 SP on Alteration. Unlocked by speaking to Saber inside your Private Room after using 100 items. This Skill replaces Artillery Applause. Will bring you back from death a single time. Unlocked after spending 65 SP on Alteration. Inflicts Stun on an enemy when using GUARD. Unlocked after spending 85 SP on Alteration. Damages enemy. REQ: Use Noble Phantasm. Unlocked after spending 99 SP on Alteration. Condition: Unlocked after 4 turns. Attacks ignore enemy's GUARD and weakens them. Automatically unlocked through story progression during the 5th week. Special conversations inside the Private Room can be triggered when you see a special icon accompanied by a yellow font in the selection window. These conversations are important factors when unlocking your Servant's Matrix Level E. Missing one of them or choosing the wrong answer could permanently deny you the information you need. Saber's Matrix is the easiest to complete because all you have to do is view the conversation. There are basically no wrong answers, so choose whatever options you like. Are you a girl, Saber? Why are you so imperious. Like, what sort of school I went to? Like, what sort of hobbies I had? Like, what sort of person I liked? I don't have a wish. To keep living as I am. To keep living in this world. To have fun and never work! Whee! I'm jealous of her personal theater. Whoa, she bankrupt her country? Requires that you defeat SE.RA.PH during Day 2. These achievements gives you new conversations inside your Private Room. Your Servant could reward you with an item, an equipment, a Skill upgrade or simply just a new topic to talk about. She'll ask you to do more flawless victory. A Perfect Battle is achieved when you defeat an enemy without taking any damage. She'll tell you to keep up the good work. She'll give you an Elixir as a reward. She'll congratulate you for being a glutton. Just buy the cheapest item and use it inside the Arena. Upgrades her Skill Artillery Applause into Thunderous Applause. She'll tell you to kill more rare breeds. Check the guide for Rare Monster locations. She'll talk about strangling a lion while naked. She'll talk about the Golden Theater. Let the enemy survive for 3 turns then kill it with your Noble Phantasm. Only normal and Rare Monsters count. I highly recommend completing the Rare Monster achievement. The conversation about strangling a lion while naked is priceless. The Noble Phantasm achievement is good too, since she mentions something about Archer's Noble Phantasm during the conversation. So is there any other purpose to using her? Seems kind of cheap if not overpowered. 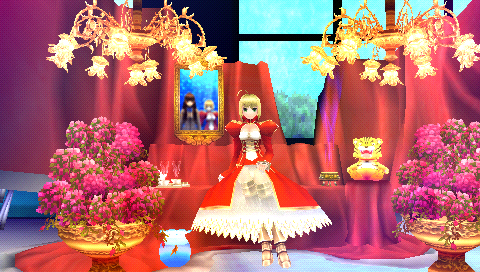 Saber is sort of the protagonist of the servants, right? Hence why she's "easy modo". lmfao! also i see france. Oh, we're doing character guides now. You haven't? It's sort of expected in a visual novel. This is already considered rather tame. I need to visit Japan one day...soon! character guides, you sliced and diced this game. I know is kind of cheap to use overpowered character, but I like when important characters are overpowered. You're using your favourite character and winning. Interesting, plus she looks cool. MAKE CASTER GUIDE NEXT!! A JOB WELL DONE!! I don't see the benefit of investing into Agility, since all it does is stabilize attack damages. I could say the same for Defense, since that would only pertain to if someone ever gets hit (which one can avoid if you spam Skills and Servant MP heals on a second playthrough). So I ask, does Agility do more than stabilize attack damages, and does Defense do more than lower enemy damage and increase skill damage? Also, to what degree does it increase skill damage? Does it heighten skill damage better than Strength or not? After investing enough points to Strength and reaching A+, it will take a lot of SP to bring it to A++ or EX. So it would be more effective to just invest the SP on another stat since there is no benefit in investing to a stat that you can't rank up. Defense increases Skill damage more than Strength does and increases physical damage more than Magic. So far Saber, Defense is the second best stat. Thanks for the quick feedback. I assume then that dumping into Agility is only because ranking up Defense would be as useless as ranking up Stength, correct? Caster's Magic was so easy to EX rank that you still have enough SP to upgrade other stats. However, if you max out Saber's Strength to EX rank, you won't have enough points raise other stats. Making her a glass cannon if raised that way. But even with only A+ in Strength, Saber have the potential to inflict around 25,000 damage in a single turn. Something Caster could never accomplish ever. Upgrading Defense to A+ should yield better stat growth than upgrading Agility to C. I've tried both and the result yields very little difference. Overall damage is increased with Agility but Defense increases Skill damage by a bit more. At this point, you can increase either of the two. Well I kind of Glass Cannon'd Caster anyway as I only really upgraded her Magic until she reached EX, so I can't say that a Glass Cannon Saber wouldn't be too foreign to me. I'll take your word for it though. So how'd you find out the Status Growths? Did you have to search through code or did you just do calculations as the game went by? Well, I think glass cannon Caster is a must because even with EX rank Magic, her maximum damage output is still pretty weak compared to the others. 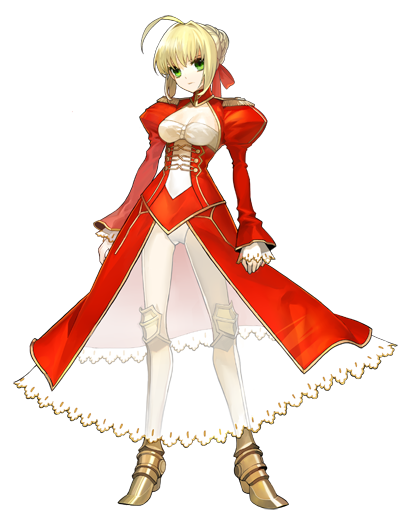 The Japanese Fate/Extra wiki have the stat growth calculation all covered. I like to put those data in this guide but I don't want to steal their hard work without permission. Well actually the one you linked was about Physical Damage and Skill Calculations. I searched though and saw the Status Growths (though not down to a precise rate like yours) such as for Archer. Speaking of Skill and Damage Calculation, though, I'd like to ask what exactly those numbers translate towards. The page seemed to be saying that Rank A for Strength, for example, would mean 6 Points in Skill Damage, while Rank A for Defense would mean 7 Points in Skill Damage. Does a single point make that much of a difference and if so how? I've been drafting some Archer Status sets based on that guide, so I'd like to know just how significant these points are. Are you going to do a walkthrough on Archer route? FOOL! It is not see-through, she is LETTING you see! Her stats according to type-moon wiki. Surprising, eh? As I am already a veteran, I recommend for beginner Atk A+ Def A ! But I like to test build, I am now doing The ATK ++ and the rest in LCK , In the third round I have ATK A + and the power of destruction is enormous with buff Gain_Luck of 5 3 attacks are critical. 1 tip: NEVER invest in magic. 1st is strength, 2nd is endurance. Agility comes after, and then comes Luck. Magic, never invest in it with Saber. Reasons being that none of her special skills benefit from the Magic stat. And not only is it her stat with slowest growth, but she even has a skill (Migraine) that reduces it's effectiveness. And it shows. Please leave a comment here. What must be defended is inevitably lost. You will know despair and emptiness. But remember, surrender to despair, and you will be no more than a pathetic dog. Never cast away hope, and live on with pride. Don't ever become like me.